I’ve always been a fan of short films, but recent praise of the short films of Neill Blomkamp (DISTRICT 9) and Carl Erik Rinsch (THE GIFT) has set me back on the path of finding great new voices in film. Particularly short film. 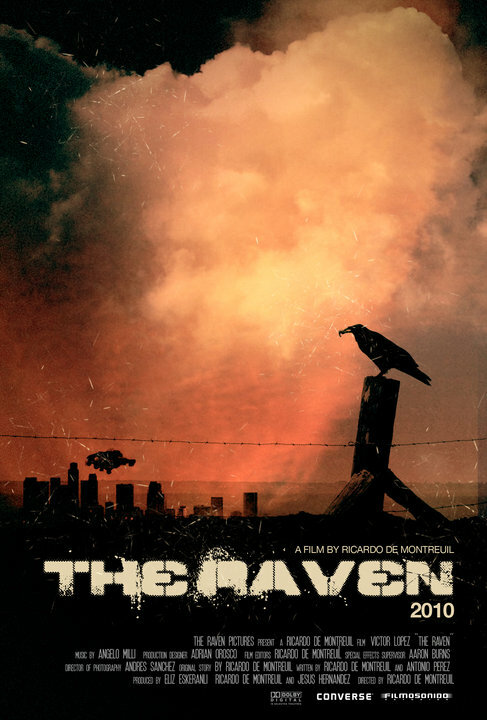 I’ve found one of those voices in Ricardo De Montreuil’s absolutely brilliant 6 minute short THE RAVEN. Fluidly filmed by Director of Photography Alex Sanchez, THE RAVEN is a chase flick, wrapped in the trappings of a not too distant, or far-fetched dystopian future, where men are exterminated by machines (considering as you read this, somewhere unmanned planes are dropping fire from the sky, and major metropolitan municipalites are considering unmanned robotic droids to police the cities… it is a fiction uncomfortably close to tomorrow’s facts). But above the cautionary tale, which has been and always will be at the heart of sci-fi or speculative fiction, it’s just a good, impressively and stylishly made film that can be enjoyed with your brain switched off if that’s your wont. But I think you’ll find it an even better film, with your brain left on, and tuned up. Victor Lopez as the title character has to carry the film, and an impressive job he does. For my money I rate this film a bit higher than both the DISTRICT 9 short and THE GIFT short. And in addition to it being a great short flick, it’s a great short flick with a character of color. And that goes a long way with me. Going back to my previous FOX rant, and extending it to all of Hollywood, I am personally sick of films with no characters of color, or characters of color as token, stooge, side-kick, or comic relief. I as a consumer, have become very Asian these days, in that I refuse to support a movie that doesn’t have characters that represent me and mine offered in progressive, uplifting roles at the least, and preferably starring roles. I have no problem with Matt Damon in a trilogy of Bourne movies, but I do have a problem with Denzel Washington and Carl Franklin despite their first Easy Rawlins film being a commercial and critical success getting shot down for funding to do the rest of the series. Or Jai White (with his brilliant BLACK DYNAMITE), and Danny Glover or Avery Brooks or many other filmmakers and actors, with their films relegated only to film festivals, and not picked up for distribution. While the millionth and one WEATHERMAN or Slacker Romantic Comedy, litters theaters around me. When a culture is denied positive, uplifting images, and is fed instead only on the media of people who dismiss them at best, deride and denigrate them at worst, you get the erosion of culture. You get an inner city of mad dogs, that absent of their own value, are absent any ability to value others. You breed mad dogs, and that is ultimately a failure for the larger society. The foundation of the empire crumbling with miseducation, poverty, violence, crime, hatred, and ignorance, can it be long before the tip of that pyramid, the pyramid of empire, slides into the sea. So these days I tend to speak with my dollars, and with my attention. So when I do see a film that is both great, and not utterly Eurocentric, I ‘m happy to give it the attention it deserves. This is a great short flick, and here’s hoping the filmmakers get the attention and funds they deserve to bring us more shorts and hopefully features. Strongly recommended! View it here! NOFATCLIPS is a great site because, unlike YouTube, it is monitored and comments have to be approved. This eliminates the lowest common denominator “discussions” that go on at You-Tube. And even more importantly it allows you to view these films without needing Flash (one of the most insecure formats ever devised. More and more viruses and vulnerabilities are being spread through bobbytrapped Flash files. If you are using Flash it is not a matter of if you’re going to compromise your system, it’s a question of when). Not needing FLASH for me is a HUGE plus. Strongly recommended site to host a strongly recommended film! So how do you separate the source from the sourced? How do you separate Black from Latin? Answer? You don’t. Though people are trying hard, the same people, the same minority, who have always relied on divide and conquer to hold their always tenuous grip on the illusion of control. And the sooner the two halves of my blood educate themselves about this, move from ignorance to epiphany, the sooner this world can pass from war to peace.